After walking the Moonwalk in 2016, I thought if I can walk a marathon, actually I could probably run one… That year, was the first year I entered the ballot. As expected, I didn’t get in, so I applied for Richmond marathon (Sept 2017), thinking that would be my first. Then I unexpectedly got a last minute charity place for Brighton marathon and I also applied to be a marshal at London. Marshaling last year at London was a fantastic experience, and I felt inspired to run it as soon as possible. I entered the marshals’ ballot full of hope! At the marshal’s after party, I amazingly pulled out my own name at number 20, so was pretty much guaranteed a place for this year. I was SOOOO excited!! Roll on to December 2017, and I started my training plan for London, feeling hopeful. At Christmas I got the dreaded flu, so had a couple of weeks out of training, but didn’t feel too bad, as it was early on. Farnborough Half went well, as did Wokingham Half, so I was happy that all was going to plan. However, then the snow came, and with the snow came a really nasty flare of Plantar Fasciitis! This meant I didn’t even attempt the (cut short) Grizzly and was advised not to run until London! I’d always thought that if I was told not to run due to injury, I would be devastated and sink into depression. But, I decided to join a gym, and just hope for the best! So for the five weeks before London, I spent time cycling, rowing and swimming, with the odd gentle park run thrown in just to check I could still run! As the big day approached, the weather reports and facebook groups started to shout about hot weather. I wasn’t too worried, as Brighton had been so hot last year. My aim was just to start in good shape, and hope to be able to finish, having been injured. 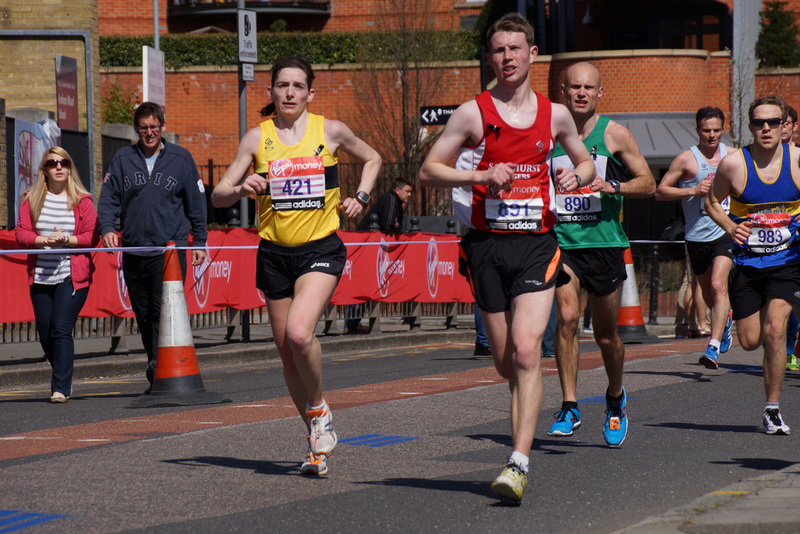 This being my first London marathon, meant it was also my first visit to the Expo. I really enjoyed this experience, and could easily have spent much longer than the 4 hours that I did! I think I could also have spent an awful lot more on the credit card too!! Finally, the big day arrived, and I woke early to have my porridge and get ready. The lovely Eddie Wilson gave me a lift to Sandhurst, where I was given the huge responsibility of being bus monitor! Once everyone was loaded onto the bus, I settled down and chatted to the other runners about what to expect. We arrived in Greenwich with time to spare, and I enjoyed chatting to some awesome SJ ladies – Claire Hobson, Emma Lewis, Tina Acock and Sacha Kendall. After a few toilet stops, and bag drop, we headed to the start! Once on that start line, it really started to sink in. I was about to run London!!!!! We finally got over the start line sometime after 10:00am and I settled into my run. At first it felt good in the warm sun, and I actually managed to run not far off my previous marathon pace. I took in the atmosphere, high fived the kids, and just enjoyed being out running again. It was great to see Paula and Fiona out on the course, and their encouragement spurred me on. After about 8 miles, it really was starting to get warm, and my heart rate was not settling down. I decided I needed to be careful, as I didn’t want to end up collapsing like so many others had started to do. By the time I got to Tower Bridge, I was really feeling the heat, and decided that I would start to take some walk breaks (not something I have ever done before). My stubbornness didn’t let me do this until I got to about 15 miles, and hit a tunnel in the shade. This was a relief, but still didn’t really make much difference to my heart rate. From this point on, I took at least one walk break every mile, which definitely was the right decision. The crowds were amazing, shouting out words of encouragement, and offering sweets and orange slices. It really helped to keep me positive, although at times, when I was walking, it did feel a bit much! As the miles started to count down, I looked forward to each mile marker and a brief walk. When we ran along embankment, I knew the end was in sight, and looked forward to seeing Buckingham Palace and those last few yard markers! It helped that I had marshaled last year, so knew what to expect. At around Mile 24, I came upon a runner dressed as the poo emoji! I would overtake her while running, and then when I walked she would go past me. All I could think was, ‘How on earth is she running in that in this heat?!? !’ Then at mile 25 I heard the shouts from my hubby and boys, and friends. This gave me such a boost, and I ran with more energy than I had had for a while. We approached the final turn in front of Buckingham Palace, and I gave myself one last walk break, then turned and ran for that finish!! I can honestly say, that was the toughest marathon I have run yet, but I will definitely be entering the ballot for London next year and my husband says he will too! !